This month I read the article by Anita Silvey, "Make Way for Stories: There's a good reason why people are passing up picture books", that was published by School Library Journal. 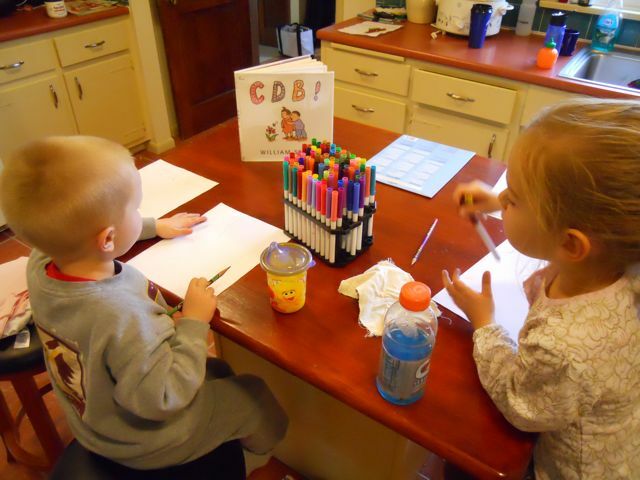 In this article Silvey states, "If I could chart a course to rescue picture books, I'd suggest that we establish the writer again as half the equation. We need real stories, and long stories, that can be read more than once." This suggestion was in response to the controversial New York Times article, "Picture Books No Longer a Staple for Children" by Julie Bosman. I have some anecdotal evidence to support Anita Silvey's suggestion. Tonight, I told my son to pick his book for before bedtime reading. 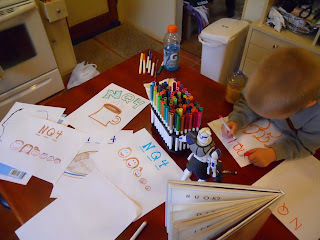 I was surprised when left his bedroom to pass up the library bag with many Star Wars and Super Hero early readers and his bookshelf packed tight with his favorite books. I figured he was heading for the two crates of recent acquired picture books from a used book sale. Yet, he returned with Shrek and Doctor DeSoto Goes to Africa by William Steig (which he found near my computer waiting to help me compose this post). These two books were among the dozen "real stories, long stories" we read this week by Steig. His choice told me that he was thinking, "These stories are so good I want to read them more than once." 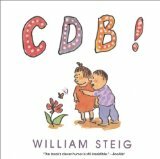 William Steig has been called the "King of Cartoons". He contributed more than 1600 drawings and 117 covers for the New Yorker magazine (Norman Rockwell Museum). His many "symbolic drawings"(for more information view section 3 of this PDF from The Jewish Museum) have been described as "an exploration, in graphic form, of the unconscious" which were published in book form in the late 1930s and early 1940s (New York Times). But, it wasn't until after the age of 60 that he published books for children. His books gave us the characters Shrek, Sylvester, and Doctor DeSoto. The characters and their stories gave Steig $500,000 (from Dreamworks to create the Shrek movies - Boston Globe), a Caldecott Medal (1970, Sylvester and the Magic Pebble), and a Newbery Honor Award (1983, Doctor DeSoto). Strangely, Steig said in an interview with the Boston Globe, "I hate to illustrate my books, because I find it hard to repeat scenes and characters." 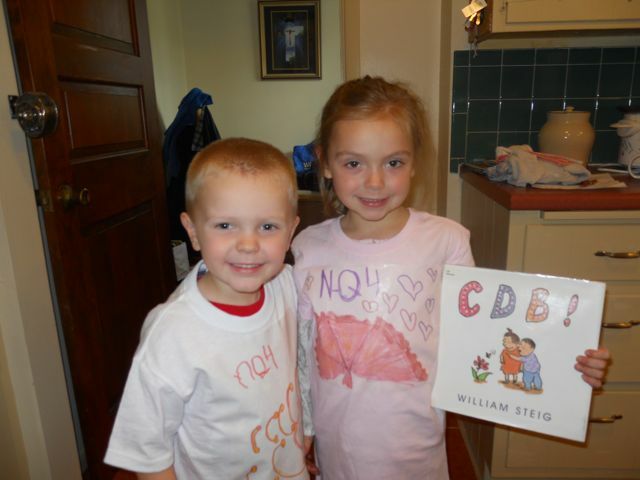 He didn't have to worry about this when he published his first book, CDB! My children loved how this book used only letters to convey an idea and that each turn of the page provided another puzzle to solve. For example, CDB is "See the bee" and D C-L S N D C is "The seal is in the sea." I thought all week for a way my children could explore this idea further and I came up with making our own CDB! t-shirts. We added the number 4 for NQ4 - "Thank you for..." Then, we drew things we were thankful for. My son drew Captain Rex from Star Wars. I drew our family. My daughter drew stuffing -- as in Thanksgiving stuffing. We then had only food on our mind. 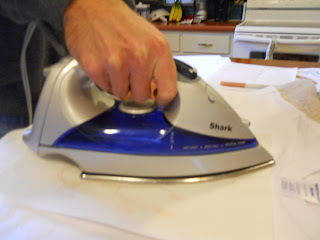 Once our drawings were complete we scanned and printed our final drawings on special iron-on printer transfer sheets. We purchased a pack of this special paper at Michaels for about $5. They are also available on Amazon. My daughter took this picture to show how we ironed the transfer sheets on to the t-shirts. Michael's also carried plain t-shirts in a variety of colors for about $4 each. 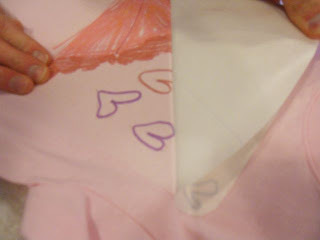 The iron-transfer paper peels right off after it cools. Here they are in their shirts -- my son says, "NQ4 Mac and Cheese!" and my daughter says, "NQ4 pumpkin pie!" 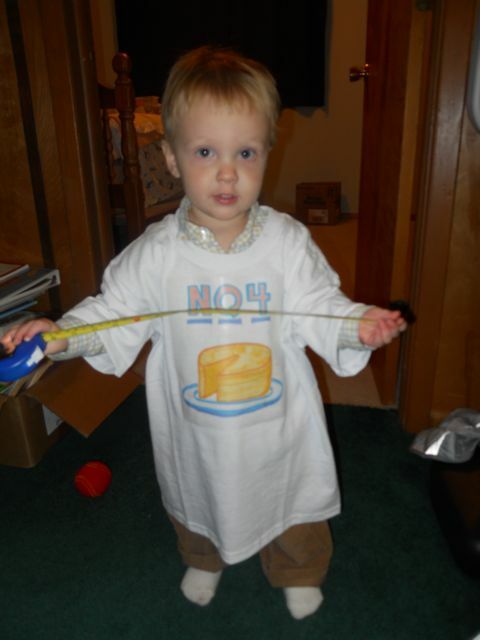 I made a shirt for my youngest that said, "NQ4 Cheese!" He just started eating dairy after having a dairy allergy for the first 15 months of his life. Boy, does he love cheese! I think we might have to wear our shirts to Thanksgiving dinner with our extended family!